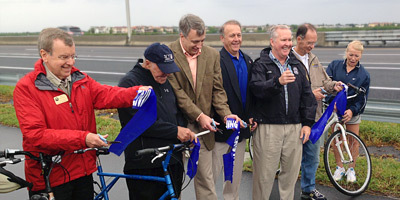 The Courtney Campbell Trail Grand Opening of the Hillsborough segment was celebrated on on November 16th at 9:00 a.m. FDOT District Seven Secretary Paul Steinman, Tampa Mayor Bob Buckhorn, Hillsborough County Commission Chair Ken Hagan, and Courtney Campbell Scenic Highway Corridor Advisory Committee Chair Bill Jonson participated in the ribbon cutting, marking the official opening of the trail. The trail is located on the south side of the Causeway & when completed will include two free-standing bridges that offer panoramic views from as high as 45 ft above Tampa Bay. The first segment of the trail is a six mile section from Rocky Point to the Hillsborough County line. The remaining three mile section from the Hillsborough County line to Bayshore Boulevard in Clearwater is scheduled to open in 2015. For more information, contact Michele Ogilvie at 813.273.3774 x 317.